My first sushi experience happened in a restaurant that now no longer exists, Mandragora. It was a pretended restaurant, with food from excellent upwards and prices to the extent. Among the „cheapest” dishes in the menu was sushi, the occasion with which I ordered it and I hopelessly fell in love with this mixture of rice with fish. I also found out about wasabi, how rare he is in his authentic form, how 90% of what is on the market is counterfeit and other stories related to the ingredients on the plate. With chopsticks there was a whole scrimmage. Some seem to be born with the special ability to grab between two sticks a glimpse of food but I fail to coordinate those two pieces of wood-the bloodline. I often get to eat it with a fork, an obvious opportunity to make fun of it but those seaweed wraps are so good, I’d rather eat it with a fork than not at all. At a time I used to get my sushi packed at home and eat it in front of the TV. Attentive to the story screen, I didn’t even notice I was starting to deal with the chopsticks honorably! And that probably happened out of idleness to move me to the kitchen after the fork. Funny part is that when I consciously try to do that at the restaurant or even at home, I just don’t get it out. I really don’t understand how the brain works on this. A friend recently told me that he never ate sushi and that he thought it was a fancy, exotic crane. Then I remembered the circumstances in which I first tried sushi (at foodie) and I think for many this dish remains an extravagance, not necessarily because of the price but especially because of „not knowing the problem”. My Lord lawyer, who Mananaca sushi for a long time and who likes it, tells me one day, very quietly, that the fish in the rounds is cooked-no? Not! I’ll call him amused. It’s cruel, you eat raw meat! -No way, I eat sushi and I like it but I don’t like raw meat, so it’s not cruel. -its to see, that you really like it and you don’t know! 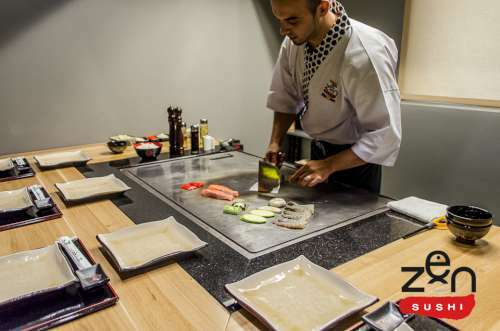 A new experience related to sushi I recently had at the opening of a new restaurant-Zen sushi Dorobanti. They really hit me with this invitation, a bigger sushi amateur in Bucharest I don’t think they found. It seems to me that there’s something magical in that taste of ingredients so simple, but disparate they don’t tell you anything. In fact, the restaurant is Japanese-specific. 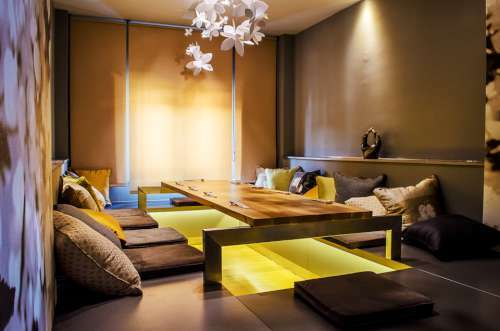 The Zen Sushi concept was born from the passion of two friends for the Japanese chef. 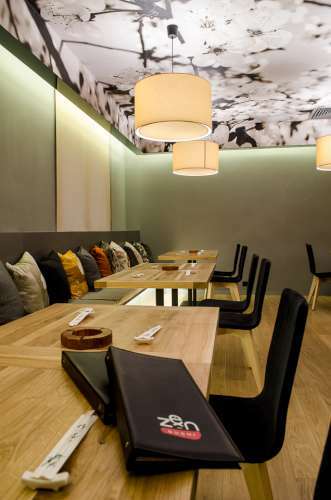 Chef Andrei and chef Julian developed their skills under the careful supervision of chef Okuda Yutaka in the first Japanese restaurant opened in Bucharest in the early 2000. I took a lot of pictures at the opening, but not very successfully. Some too personal, others too blurred, I thought this time, the „official” photos offer more useful information than the pictures I made. The ceiling is interesting, isn’t it? I really enjoyed the intimate and special atmosphere. I feel comfortable in the very crowded places, where you basically get lost in the crowd or on the contrary, the very private places. Table for Teppanyaki , the absolute novelty for me, offered a great show of days. 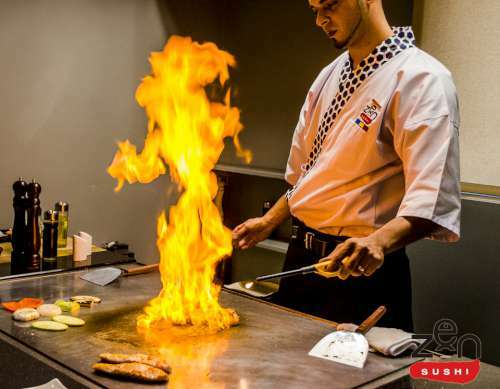 Teppanyaki is a traditional Japanese style to cook food on a hot hob, under the eyes of the Customer you conquer with flavor, taste and of course with the art of the show. Okay, well, fabulous food for good but what about the ZEN in the name? After seeing the location, I understand that ZEN includes you instantly, ever since the entrance to the intimate but insightful courtyard of the restaurant, in which a superb Japanese inspired garden was arranged. The launch also impressed by welcoming the guests on classical music-violin, viola and cello agreements with a glass of champagne. 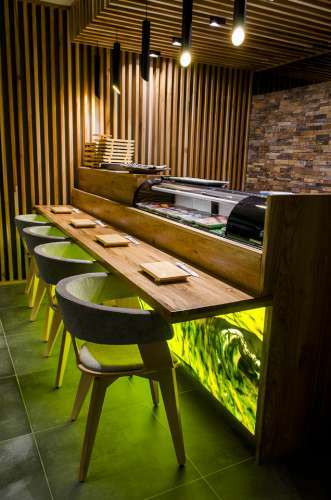 For those who want to serve Japanese food and fresh sushi in the middle of the city, I highly recommend Zen sushi Dorobanti-George Călinescu Street, No. 15, open from Monday to Saturday between 12-23 and Sunday from 13 to 22.30. To the table for Teppanyaki Reservation must be made on the telephone number.